Can you hear when she says: "Buongiorno, sono Maura Garau di cyberitalian.com"? 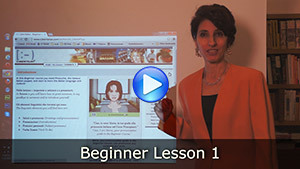 Browse through the lesson with Maura, using the menu on the right. In this Beginner course you meet Pinocchio, the famous Italian puppet, and start to learn the Italian language and culture! Nella lezione 1 imparerai a salutare e a presentarti. In lesson 1 you will learn how to greet someone, to say goodbye to someone and to introduce yourself.